When it comes to building momentum towards a strong 2014 season on the NASCAR K&N Pro Series East, the first two events in a three-day span were a success for 16-year-old Brodie Kostecki. The Sunoco Rookie of the Year candidate and his Team Arcoplate Racing No. 43 team built chemistry, the car improved each and every lap throughout the first two races at New Smyrna Speedway and Daytona International Speedway in Florida, and Kostecki built the valuable experience in the ultra-competitive K&N East tour. The only thing that did not go Kostecki's way in the February 16 event at New Smyrna and the February 18 UNOH Battle at the Beach at Daytona was luck. Kostecki qualified the Arcoplate No. 43 inside the top 10 for both races and had made moves to be in position for strong finishes before occurrences he couldn't avoid took away those chances. 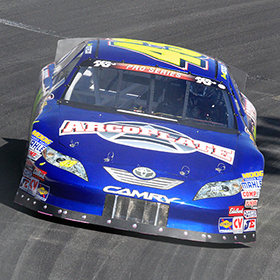 Kostecki qualified fourth and was still in the top-10 at New Smyrna before the car's handling went away. He was inside the top three when he was struck by another competitor at Daytona. Both incidents put a damper on otherwise solid efforts for Kostecki in the season-opening double events. "We definitely qualified well at both races and we needed races like at New Smyrna to work out the glitches with this Arcoplate 43 car," said Kostecki. "We are going to learn from these races and hopefully turn our luck around. There's a big learning curve for us and I know Doug (George, crew chief) will continue to work hard to help us get the results we deserve the rest of the year." At New Smyrna, the first race of the 2014 NASCAR K&N Pro Series East season, Kostecki qualified fourth and was making progress towards the front when the car's handling faded and wasn't able to be rectified through the course of the race. After the race, the team discovered an issue with the front suspension that hamstrung the effort. "We just got really tight and we struggled with that," said Kostecki after the New Smyrna event, where he finished 20th. "We just have to make the tires last a bit longer too. The tires that we had for the setup just didn't work. Like I said, a lot of the things we'll do will be learning experiences, but we have to make the best of those learning experiences too. We'll rebound and keep moving forward." Two nights later, Kostecki had another impressive qualifying effort and started the UNOH Battle at the Beach from the seventh position on the back stretch course at Daytona International Speedway. He had worked his way into the top three nearing the race's halfway point before another car made contact with him from behind. Kostecki saved the car from disaster, but the car's handling was never the same. After several pit stops, Kostecki hung on to score a 18th-place finish with the Arcoplate No. 43. "The Arcoplate/Canine Companions for Independence car ran really well at Daytona," said Kostecki. "At New Smyrna, we were strong in qualifying, but we didn't have the right package for the race. At Daytona, we were a lot better in the race and weren't as good in qualifying. It's a tough deal for us because we're a new team going up against some really strong teams, but we showed at Daytona that we can compete with the best of them. "I got hit by another car behind us and I got into Kenzie (Ruston) by accident. It was just a chain reaction of everyone checking up. The rear tires came completely off the ground twice through the course of the race. But that's Daytona. It's going to happen." Kostecki and Team Arcoplate Racing now will focus on the completion of a new Arcoplate No. 43 for the March 15 NASCAR K&N Pro Series East event at Bristol Motor Speedway in Bristol, Tennessee. "We're getting a new car ready for Bristol and it will be good to give this car, the one we ran at both New Smyrna and Daytona, a break. We have this car pretty close to my liking now and I'm excited to take the new one out to Bristol. These guys on the team work so hard and we're getting close to getting the finishes we deserve."